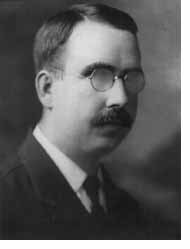 In 1899, Austin O. Wilson, a legally blind young man in his early 20s, was concerned about the lack of Christian reading material available for the blind. He decided to try an experiment. Taking a clothes wringer, he modified it to accommodate two metal plates with a sheet of heavy paper between them. As the plates were squeezed through the wringer, the raised dots on the plates made an impression on the paper, producing one page of a braille magazine he entitled the Christian Record. It started with the dream of one man. More than one hundred years later, the Christian Record is still being published, along with eight other periodicals. Austin Wilson produced 75 copies of the first Christian Record. In the 1920s, the Christian Record was being placed in the hands of thousands of blind people around the world. In 1933 and 1934, Christian Record was one of the exhibitors in the Hall of Religion at the World's Fair, themed "A Century of Progress," in Chicago, Illinois. A year later, Christian Record was again prominently represented in the Hall of Science at America's Exposition, held in San Diego, California. In 1950, the first talking books were recorded for Christian Record. There are now over 1,600 talking books available through the Christian Record lending library. In 1967, National Camps for Blind Children was formed. That first summer camp was held in Florida with 23 youth. Since then, nearly 50,000 campers have attended these special camps. In August of 1999, Christian Record Services celebrated 100 years of service to people who are legally blind. 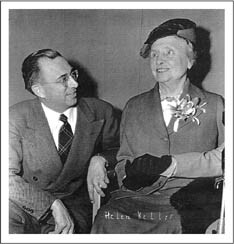 Helen Keller receives a visit from John Baerg, a Christian Record Services representative. Helen Keller was born in Tuscumbia, Alabama on June 27, 1880. In 1881, at the age of 19 months, she lost her sight and hearing as a result of meningitis. For more information about Helen Keller, be sure to visit the Helen Keller Archives at the American Foundation for the Blind.